Basements that are below the water table in your yard can be extremely susceptible to moisture and water entry. Regardless of whether you use your basement as a finished living space or as a storage unit, taking the time to waterproof it can help prevent water damage down the road. Ideally, your basement should be waterproofed as it is being built or being refinished. There are special steps you can take as you build or remodel your basement to help ensure it stays dry and watertight. 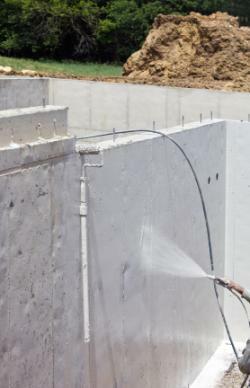 If your basement or foundation has been newly poured or built, spray the exterior of it with waterproofing solution to help seal out moisture from the outside. This simple step can help protect your basement from excessive moisture. Pour the sealer into the spray tank according to the manufacturer's instructions. Carefully spray a continuous stream of sealer over the entire outside of your basement's visible exterior. Overlap each stroke slightly to ensure good coverage. The sealer is clear and will dry matte, but will go on slightly wet looking. Look for dry areas to ensure you don't miss any. Let the sealer dry according to manufacturer's instructions. Deco Sealers - 100 percent green interior and exterior sealers. Aquaseal - All weather cement and concrete weatherproofing sprays. If you are finishing your basement and installing drywall, make sure you install a vapor barrier first. Vapor barriers consist of clear plastic sheeting that go beneath the drywall and extend slightly onto the floor to prevent moisture from seeping into the walls. This step is more difficult than simply painting or spraying on a coating, but can be an integral part of your basement's finished walls. If your basement floor is new or in very good shape with no cracks or previous water entry, apply a waterproofing membrane to it before installing flooring. A waterproofing membrane is a thin, flexible surface that seals your cement floor so no water can come up through it. Applying it can be as simple as painting the floors. Clean the floor well. Sweep or vacuum away any debris that may get caught in the membrane. The floor must be clean and dry to begin. 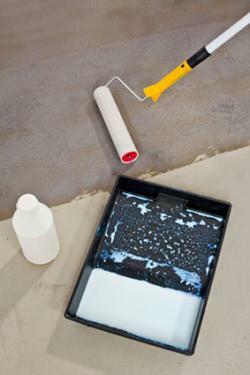 Pour the membrane out into a paint tray and dip the roller into the tray. Work the roller back and forth in the tray to fully saturate the nap with the membrane. Roll the membrane out onto the floor, starting with the area furthest from the door. Paint in overlapping strokes, covering the entire floor and working backwards to the doorway. Let the membrane dry completely before walking on the floor. Purchase waterproofing membranes from these retailers. RadonSeal: Seals out both moisture and radon gas within the basement. Laticrete: Thin, easy to move waterproofing membrane that can be installed beneath any flooring. Older basements frequently need special attention to help waterproof them. Frequently, older basements may have already had moisture enter, or there may be multiple cracks and openings that can let moisture in some time in the future. Whether you are planning on finishing the basement or not, the first step to waterproofing an older basement is sealing up the cracks. Once any cracks are filled, you can choose to install a vapor barrier, lay down a waterproofing membrane, install a sump pump or seal up the entire room. Depending on how many cracks there are and whether or not you plan on finishing the basement and installing a vapor barrier, there are two techniques you can use: sealing the isolated cracks, which is a simple, one-step process, or sealing the entire basement, which is a time-consuming and more difficult process. Isolated cracks are a frequent point of water entry in basements and tend to develop over time due to moisture exposure. 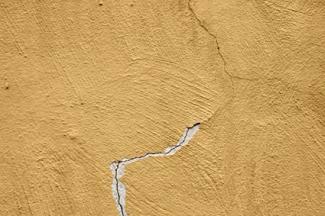 Before you can tackle any waterproofing that may be done in newer basements, these cracks need to be filled first. Use this method only if you have one to two cracks per wall or floor. If you have any more cracks than this, you should seal up the entire room. Cut the tip off the caulk tube with the utility knife at a 45-degree angle. Insert the end of the caulk tube into the gun and push the plunger into the back. Prime the trigger a few times to get the caulk flowing. 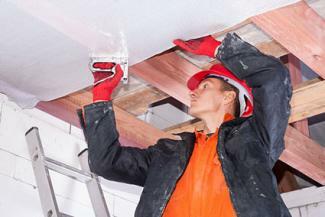 Squeeze a thick bead of caulk into each visible crack in the walls. Fill each crack completely; some cracks go through to the outside and will require a great deal of caulk to fill them up. The polyurethane can shrink and expand with the concrete to help seal the cracks. Dap - Crack repair caulk. If your basement has multiple cracks or is made up of fieldstone and mortar, you need to seal everything to ensure you get all the various water entry points. This method will completely seal the basement against moisture; you can finish it or leave it as is after this treatment. Spread a layer of rubber primer over any visible cracks or old fieldstone masonry with a trowel. Use the flat edge of the trowel to skim the primer over the cracks and create a smooth surface. Paint a layer of liquid rubber base or waterproofing membrane over the entire area. Overlap each stroke slightly to ensure no areas are left uncovered. Allow the base to dry. Paint on a layer of waterproof topcoat over the entire area. Overlap each stroke slightly to ensure there are no uncovered areas. Allow it to dry. Purchase all three waterproofing materials from Sani-Tred. As a final waterproofing step to ensure your basement stays moisture free, install a sump pump below the water table. Sump pumps can help remove any moisture that enters the basement from below ground level and can add a final level of protection to your home. Waterproofing your basement makes sense even if you aren't using it as finished space. Excessive moisture can lead to mold and mildew growth, as well as rotting of furnishings and damage of the cement itself. Take the time to waterproof your basement and protect your home.